We saw reports coming this week claiming that Microsoft is making it more difficult (read: impossible) to avoid Windows 10 upgrades. The company is, however, denying these claims. A report from The Register claims that there is no cancel option in the update dialog box anymore, as the user is presented with choices to either upgrade instantly or choose a upgrade time. As you can see in the screenshot below, there is no X button, and only two options. Report also claims that users also aren’t able to re-schedule the chosen upgrade time once they have selected a date and time to upgrade on this dialog box. A Microsoft spokesperson has stated that the information published by The Register is “inaccurate,” and that the user who saw a missing X button had in fact agreed to updating to Windows 10. The screen appeared when the user had already accepted the upgrade and agreed to EULA. While it’s not a good design to not offer a right to the users to go back and not upgrade, if they change their mind. However, it’s still better than removing the close button altogether, or removing the rescheduling choice. The lesson? 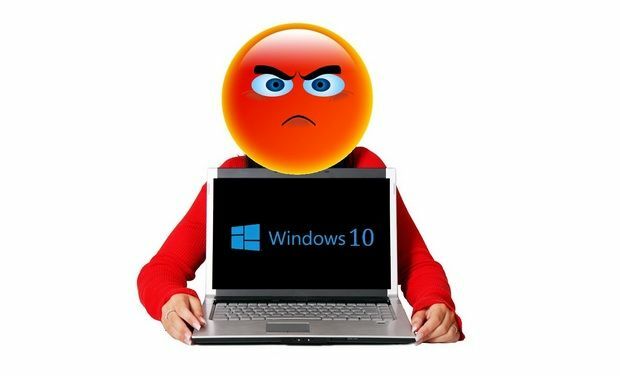 Make absolutely certain that you want to update to Windows 10, because there might not be any going back from that decision. 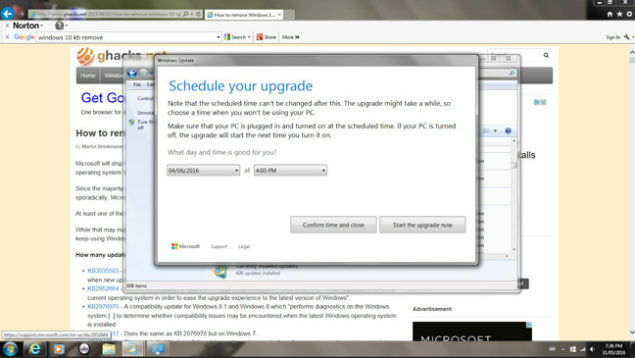 For now, the company is still offering the choice of opting out of Windows 10 upgrade. Remember, clicking the X button on the Get Windows 10 (GWX) will no longer opt out of the upgrade, but will confirm it. You will have to reschedule or cancel the update on the following pop-up. Microsoft’s latest desktop OS is slated to receive a major Anniversary Update this July; the update is expected to bring some significant feature and design enhancements, and performance improvements to the OS. Users have until July 29 to avail the free Windows 10 upgrade offer. Following this, the operating system will be offered for $119 to Home users.